Yesterday we discussed traversing the CodePlex tool offerings for SQL Server. Our first installment is the SQL Server 2008 Extended Events SSMS Addin written by MVP/MCM Jonathan Kehayias (blog|twitter) of SQLskills.com. The install was a simple GUI installer and after an SSMS restart, I could see the nice little GUI as seen in the image below. This is great idea because there is currently not an extended events interface in SQL Server Management Studio. Personally, I haven’t worked very much with extended events, but I would like to learn more. With that being said, I am not sure if the tool works or not because I really do not know what I am looking for. Does this image mean I have an error? When I click on the event , it does nothing which leads me to believe that I do not have an error. 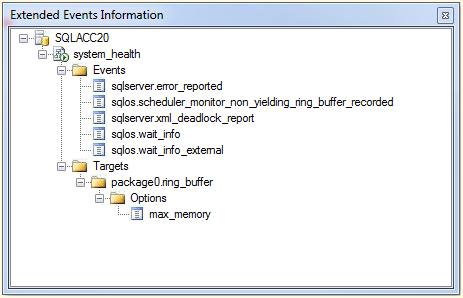 I do see where I can edit the event session “system_health” but I am not sure if the items in the list are always there or only there when the event fires? Jonathan is an MCM and is much smarter than me in regards to SQL Server, so maybe someone else can comment on this tool? Maybe we can convince Jonathan to create some documentation. Enjoy! Posted on June 19, 2012, in Maintenance and tagged CodePlex, SSMS. Bookmark the permalink. 2 Comments. Feel free to ping me if you have any questions after going through that post. I’d be more than happy to answer them for you.